FOR MOST OF US, ANTARCTICA IS A PLACE OF THE MIND. FOR CT MADIGAN, A MEMBER OF THE 1911 AUSTRALASIAN ANTARCTIC EXPEDITION, IT WAS A VERY REAL PLACE WHERE SOUTH AUSTRALIA AND THE BRITISH EMPIRE BECAME DISTANT MEMORIES. A CENTURY LATER, AS A RECIPIENT OF AN AUSTRALIAN ANTARCTIC ARTS FELLOWSHIP, MADIGAN’S GRANDDAUGHTER, HARPIST ALICE GILES USES MUSIC TO REIMAGINE HER GRANDFATHER’S VOYAGE, BREAK THROUGH OUR FROZEN CONCEPTION OF THE PLACE AND LET THE STRANGENESS OF THE LANDSCAPE SEEP INTO HER OWN PERFORMANCE PRACTICE. Since the real of Antarctica does not affect us in the same way today, it is not surprising that the heroic age of Antarctic exploration persists as our privileged image of the place. Today scientists are shunted around Antarctica in temperature-controlled bubbles and the category of ‘explorer’ has all but disappeared. However, thanks to an increasing interest in artistic ‘exploration’ of the continent, this monochromatic and silent image is giving way to digital clarity and surround-sound clamour as cinematographers, sound artists—and harpists—rediscover the continent with hand-held recording devices. ANU’s Antarctica: Music, Sound and Cultural Connections Conference showcased some of these processes of exploration, including Alice Giles’ Alice in Antarctica concert. Alice in Antarctica reveals Australian composers’ dated understanding of the place as an object composed of shimmering surfaces and characteristic scenes (mainly involving penguins). It then asks, through a rapprochement between the natural environment and the harp, how the Antarctic environment might be understood on a personal level and affect musical practice. 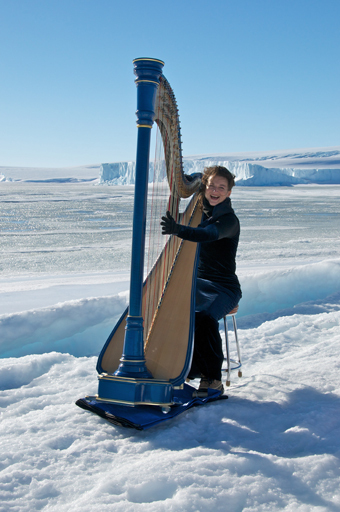 Armed with a small lever harp and a full sized electroacoustic harp, Alice Giles arrived in Antarctica with a program, like a series of letters known by heart, of works composed about a continent largely unknown to Australian composers. Joshua McHugh’s “Billions of Penguins” for solo harp consisted of a series of vignettes characterised by waddling penguin rhythms. Jim Cotter’s “On Not Dancing with Penguins” expressed frustration at not being able to accompany Giles to Antarctica and painted the Antarctic landscape through repeated rising and cascading figures. One of the most arresting compositions from Alice Giles’ journey is the video of her lever harp standing alone on the beach at Davis Station. The wind passing by the strings produces a constantly changing tone while the ice slushes on the shore and an elephant seal goes for a dip. It is a magical, minimal meeting between the elements and music, as if you had introduced two animals to each other for the first time to see if they would get along and they started singing to each other.